LIVING AT ITS FINEST IN GREAT 55+ COMMUNITY AREA. THIS ALL CUSTOM BUILT 2 BEDROOM 2 BATH ALL BRICK DUPLEX WAS BUILT BY THE OWNER FOR A FAMILY MEMBER. IT OFFERS CROWN MOLDINGS WITH BACKLIGHTING, NICE CUSTOM CABINETRY, BUILT IN DESK IN THE KITCHEN, A LAUNDRY ROOOM WITH BUILT IN IRONING BOARD. THE MASTER BEDROOM HAS DOUBLE VANITY SINK, WALK IN CLOSET AND ACCESS TO THE KITCHEN OR HALL WAY OFF THE GARAGE, LARGE WINDOWS, GAS FIREPLACE. OVER SIZED 2 CAR GARAGE SECURITY SYSTEM. A GREAT PRIVATE REAR YARD WITH COVERED PATIO. PROFESSIONALLY LANDSCAPED YARD WITH IRRIGATION. 1340 SQ FT ML OF LIVING SPACE. 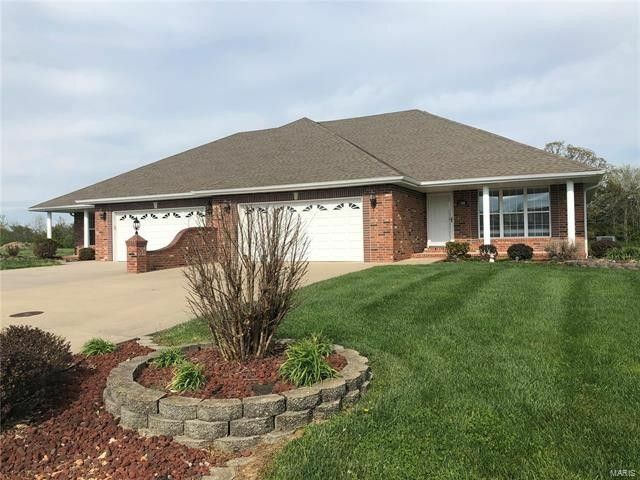 THIS WOULD MAKE A GREAT INVESTMENT WITH RENTAL INCOME POSSIBILITY OR THE PERFECT LOCATION TO RETIRE CLOSE TO SHOPPING, HOSPITAL & DOCTOR OFFICES, EASY ACCESS TO I-44 MAKE YOUR APPOINTMENT TODAY TO SEE THIS GREAT PROPERTY.